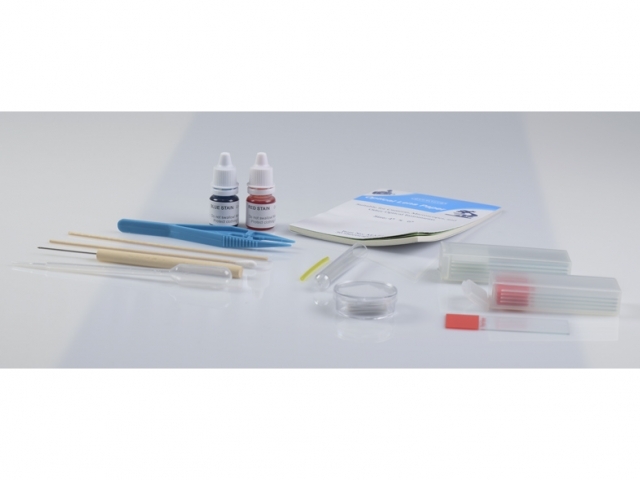 Fish disease identification kit, containing slides, coverslips, stains, mountants and all the items needed to make skin scapes and gill swabs. Easy to follow instructions. Kit bevat alle stains en materialen voor de bepaling van de vruchtbaarheid van honden. Met stap voor stap instrukties meegeleverd. Voor deze kit heeft u wel een mcroscoop nodig. 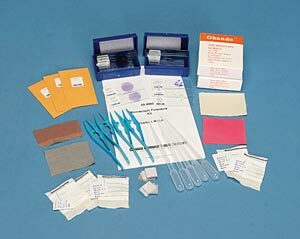 Go through forensic "training" by observing labeled slides of materials typically found by forensic investigators at a crime scene, including hair, blood, and textiles. After studying the known slides, you are presented with a mock murder mystery and "evidence" found at the crime scene. Then examine the evidence, compare it to the testimonies of the suspects, and pinpoint the culprit. 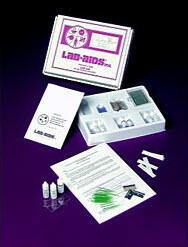 Kit includes a forensic slide set with accompanying descriptive text, mystery story, evidence, and instructions. Become "plant detective" while learning about basic plant structure. 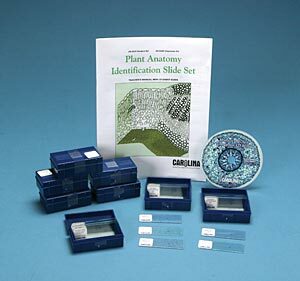 Study slides of different plant parts (roots, stems, leaves, and flowers) and use the knowledge gained to identify the part represented on a "mystery" slide. These sets include 5 reference slides, mystery slide, and teacher's manual with student guide. A selection of living microorganisms representing algae, protozoa, bacteria, and fungi. 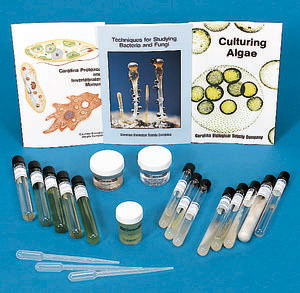 Set includes 16 organisms, in appropriate containers, plus 3 booklets: Protozoa and Invertebrates Manual, Techniques for Studying Bacteria and Fungi, and Culturing Algae. Enough materials for 30 students. Learn to make simple, permanent slides and observe shapes, structures, and textures. Includes samples of cork, foam, dust, colored thread, letter "e," and salt crystals. Perform an actual technique used by forensic anthropologists to determine the age of an individual at their time of death. 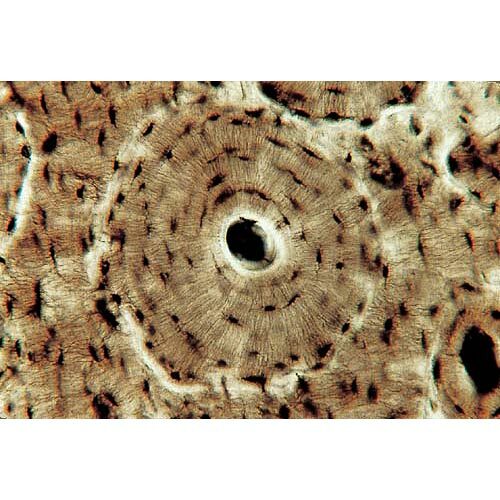 Gain valuable microscopy and anatomy skills in this activity as you learn to count, measure, and analyze the Haversian systems in bone using a compound microscope with an ocular micrometer (not included). 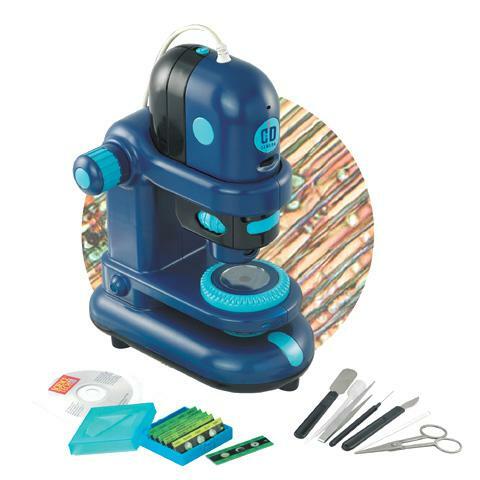 Includes a stage micrometer, six prepared microscope slides of ground human bone, a teacher’s guide, and student copymasters. See how everyday items appear strange, yet fascinating under a microscope. 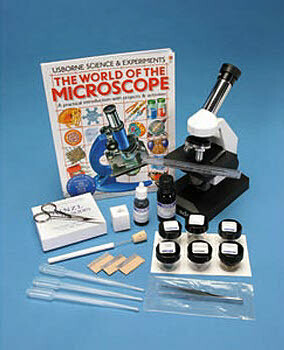 Kit includes the book The World of the Microscope, specimens, and other materials for performing several exercises from the book. 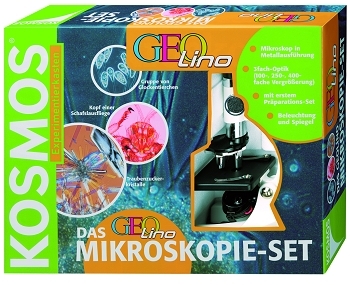 Includes enough material to make over 100 microscope slides. 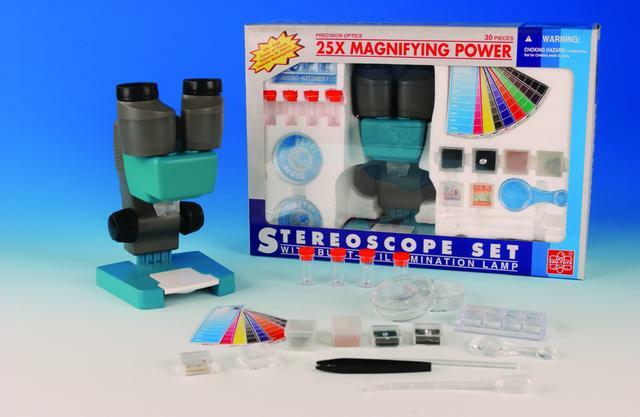 Including a Wolfe Cadet Student Microscope. Entdeckungen in der Welt des Kleinsten. Hier finden neugierige junge Forscher alles, was sie brauchen, um dem Mikrokosmos ein paar seiner kleinen Geheimnisse zu entreissen. 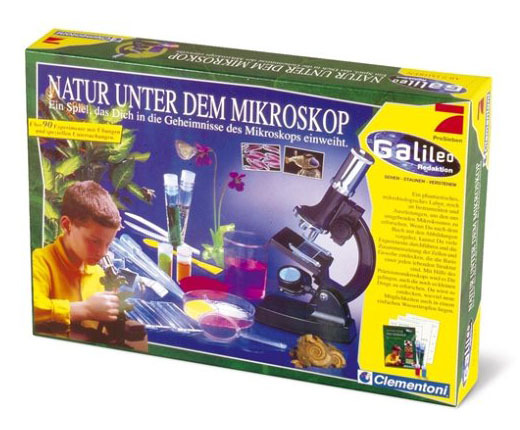 Mit Qualitätsmikroskop und Präparations-Set. Qualitätsmikroskop in Metallausführung mit 3fach Optik, Vergrößerung 150-, 250- und 400-fach etc. 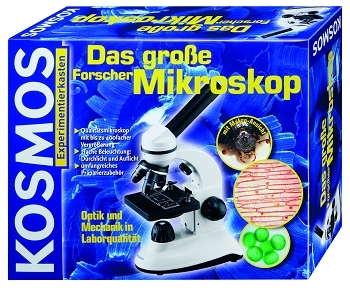 Mit diesem KOSMOS-Qualitätsmikroskop können junge Forscherinnen und Forscher die Mikrowelten selbstständig erkunden. Nicht nur „klassische“ mikroskopische Präparate wie das Zwiebelhäutchen oder Kleinlebewesen aus dem Heuaufguss können im Durchlicht betrachtet werden. Auch flache Objekte aus Natur und Alltag (z.B. Blätter, Blüten, Insekten, flache Steine, Münzen, Briefmarken usw.) können im Auflicht mit Makro-Vergrößerung betrachtet werden. Die hohe Qualität der optischen und mechanischen Teile garantiert Freude und Zufriedenheit bei spannenden Untersuchungen in der Welt der kleinsten Dinge. Umfangreiches Zubehör zur Präparation und eine ausführliche Anleitung mit vielen praktischen Tipps begleiten die Naturforscherinnen und -forscher dabei. 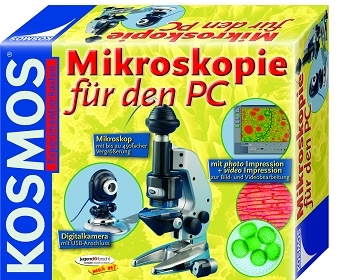 Mit diesem Experimentierkasten können junge Forscher den Mikrokosmos nicht nur betrachten, sondern in digitalen Bildern und Videos auf den eigenen PC holen, bearbeiten, ausdrucken und archivieren! Der Komplettsatz aus einem Mikroskop mit bis zu 450-facher Vergrößerung, einem Digitalkameraaufsatz mit USB-Anschluss, einer leicht bedienbaren Software und hochwertigen Dauerpräperaten lässt keine Wünsche offen. Ein phantastisches mikrobiologisches Labor, reich an Instrumenten und Ausrüstungen, um den uns umgebenden Mikrokosmos zu erforschen. Wenn Du nach den Abbildungen des Anleitungsheftes vorgehst, kannst Du viele Experimente durchführen, dabei die Zusammensetzung der Zellen und Gewebe entdecken, welche die Basis einer lebenden Struktur sind. Mit Hilfe des Präzisionsmikroskops wird es Dir gelingen, auch die noch so kleinen Dinge zu erforschen. Using live (very fresh) celery, you observe mitochondria microscopically, both as cytoplasmic particles and as centers of enzyme activity. Prepare your own celery slides which you stain using Janus green B stain, which acts as a hydrogen acceptor. This allows you to "observe" mitochondria oxidizing food mainly by the removal of hydrogen, which is indicated by the stain's gradual loss of color. 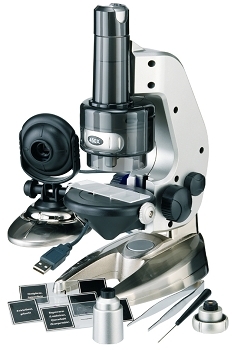 This lab requires a microscope (not included). Includes: 3 drop controlled btls. each sucrose solution, Janus green B stain, and sodium bisulfate solution; 30 microscope slides, 30 cover slips; 30 single edged razor blades; 1 pkg. absorbent paper; 1 pkg. plastic toothpicks; 30 student worksheets and guides; 1 instruction manual with MSDS. Complete all experiments in our exclusive manual of DigiSkope experiments with these convenient collection of specimens, supplies, and general materials. 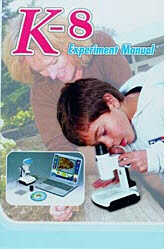 The kit features many experiments including the observation of sea monkeys, creating crystals, comparing fabrics, the beauty of mold, owl pellet dissection, observing pond life, forensics and more. Manual included. 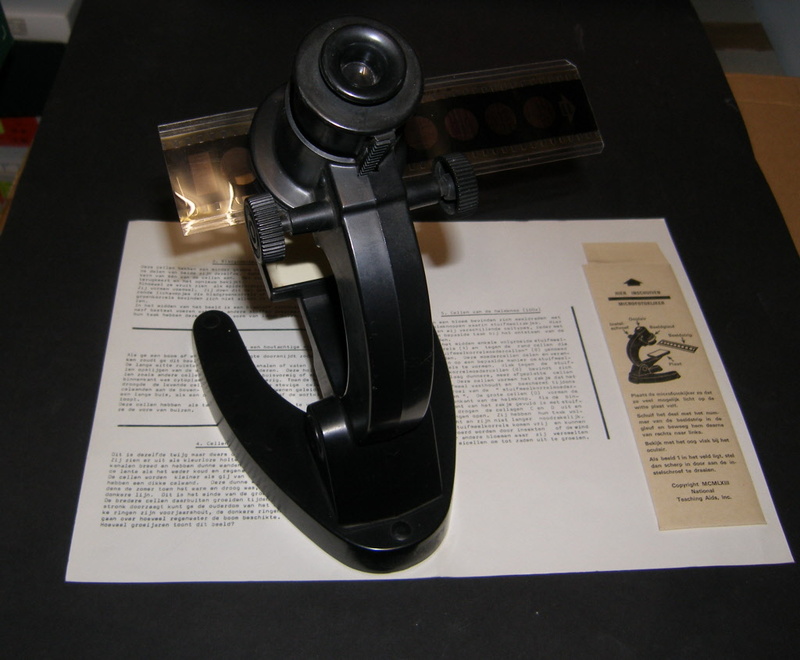 Met deze viewer kan men Microslides bekijken, een prima alternatief voor een microscoop, perfecte foto's op een 35mm film strip. Geen verlichting nodig. Met afstelknop voor een scherpe focus. Elke set bestaat uit een 35mm filmstrip met acht verschillende afbeeldingen van gekleurde preparaten. De strips zitten in een folder met beschrijving van elke afbeelding. De foto's zijn niet van echte preparaten te onderscheiden. Meer onderwerpen beschikbaar, mail voor een lijst.